“The Ballad of Gregorio Cortez” takes its title from the folk song that sprang up in the wake of the real-life eponymous character, a Mexican-American farmer who evaded a massive manhunt in turn of the century Texas after he was accused of killing a local lawman. If that gives this 1982 film the whiff of legend, director Robert M. Young mostly tries to see through it, often juxtaposing notes of The Ballad of Gregorio Cortez against the film’s more modern synth score. 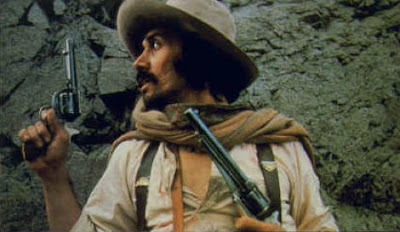 And while some of the opening sun-dappled images of Gregorio Cortez (Edward James Olmos) galloping through the countryside while lawmen give chase might tilt toward mythic, they blunt some of that myth with low angles and close-ups, emblematic of the film’s overall visual style, one that is often handheld and rooted to its characters, like a bystander to history. Even scenes that give rise to the notion of Cortez’s supposed mystical hold over his horse are conveyed in tight frames with no music, making us impartial observers, left to decide whether the outlaw does have some superpower or if he’s just a desperate dude trying to assuage his horse. And in no way does Young force the legend under the microscope more than his Rashomon storytelling device. That Rashomon Effect is filtered through Bill Blakeley (Bruce McGill), a reporter for the San Antonio Express, who comes to the border on the Cortez beat and falls in with both the posse of Sheriff Frank Fly (James Gammon) and the Texas Rangers overseen by Captain Rogers (Brion James), sidling up to various men in each outfit to get their stories of what happened with Cortez. This might sound like an expositional gimmick, but it plays better and differently, not least because of the twinkle in Bruce McGill’s eye, where he seems to sense the shifting nature of the story in each encounter. At the same time, Young uses this storyline to show how not just fables but news stories themselves are shaped by sources, and how those sources can differ, and how both legend and public opinion can so easily take hold even if they are not accurate. In a later scene, while on the lam, Cortez, shoveling food into his mouth in some dusty little diner, overhears a few American men reading aloud about the manhunt from a newspaper, a literal evocation of his narrative being penned without his own input. The confusing nature of these stories is underlined in the movie’s sporadic action scenes, usually gunfights where myriad bullets are fired though at whom is deliberately left unclear, the editing opting for obfuscation rather than clarity, getting across why all these men talking to Blake have differing impressions. And while the inciting incident itself, when Cortez shoots the Sheriff, is recounted from opposing viewpoints — Anglo and Mexican — neither one, brilliantly, is ever held up as right or wrong, merely differing interpretations based upon inherent fears and prejudices. Though Young places the recounting of the incident from Cortez’s point-of-view closer to the end than the beginning, slyly shading our sympathy toward him, he never portrays the American lawmen as outright evil, motivated more by a xenophobia that arises from misunderstanding, brilliantly emblemized in how the shooting stems not from anything sinister but from an American Spanish translator who cannot tell the difference between caballo (horse) and yegua (mare). The final third of “The Ballad of Gregorio Cortez” involves its main character’s trial, which is thankfully limited to closing arguments, though those principally just rehash in explicative form what the flashbacks have already suggested, followed by a thwarted lynching of Cortez. That it is thwarted is courtesy of Sheriff Fry, a fiery scene owned by Gammon whose growl goes a long way in convincing that he alone could stand out an armed, ravenous group. And doing so suggests something humane, yes, but also a societal change, one ceding vigilante justice for actual law and order, a slightly calmed down wild west. Then again, as the move winds up, Cortez is led away as the closing titles explain how the real Cortez’s fate went back and forth between guilty and not guilty for pretty much his whole life. If the wild west calmed, in other words, Anglo-Mexican relations never really did, and the movie’s open ending is, even now, right here, today, still waiting to be written.